The RER train network connects Paris center with the suburbs including the airports and Disneyland Paris. Compared with the metro, the RER trains make fewer stops and drive mainly outside through the city. There are 5 RER lines (A, B, C, D and E). 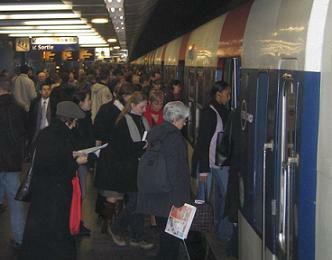 The RER trains and metro’s make often a stop at the same station which makes it easy to use them. Line B rides through Paris center (along the Notre Dame, Chatelet-Les Halles and Gare du Nord) to the airports. Line B consist of several parts (B2, B3, B4 and B5). One of the end stations of RER line B is the train station at Charles de Gaulle Airport.